Does your local library have an author day? If you're not sure, it's a good thing to check out, since they feature local authors and you can chat about their work and possibly even get a book signed or at least some shiny new bookmarks! The photo here was taken yesterday at my local library. 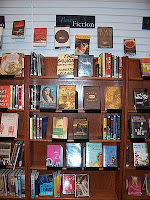 The last time my kids were there, they noticed Rehearsal: A Different Drummer was featured under the "new fiction" section. I didn't even know they had ordered it, so it was a nice surprise and I, of course, had to go back with my camera. It reminded me that our author day is generally in August. I attended their first one a couple of years ago, but was away last year. So, looking around for a sign, I saw that it was to be held the last weekend of this month, only a few days before I can say I'm no longer local to this area. Our household goods will all be packed away in a moving truck and our house will be empty other than our suitcases, but I'll be at the library chatting with any patrons who drop by, along with at least 19 other authors. A note to authors: always keep promo items stocked and on-hand for these last-minute opportunities! And if your library doesn't have an author day, ask them about starting one. Some of them will allow you to sell your books there, but even if they don't, it's a great way to encourage patrons to pick it up from the library and read it. If they enjoy it, they're likely to spread the word.